Lock-Jaw PRO Collars (Pair) for 2" bars. Fits all Olympic (2”/50mm) bars. 12-ounces per pair. BLACK w/ Red Clip. Spring Collars (Pair) with 90-Degree Handles 90-degree handles makes for easy on-and-off. Fits all 2" bar sleeves. Chrome-plated. Handles come with rubber caps. 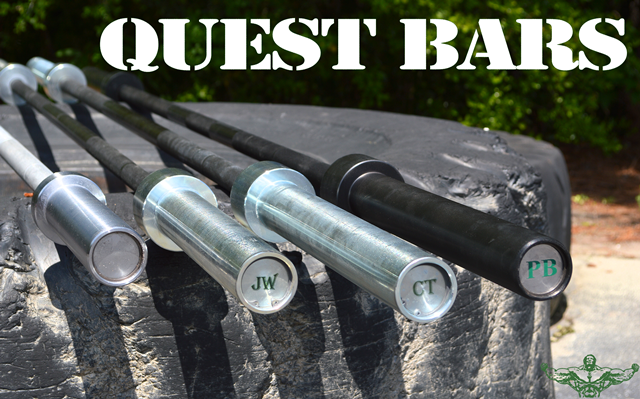 **Out of Stock** Q-Bar (IPF Approved) Proudly Made in USA. Weight: 20KG Bar diameter: 28.5mm. Bar Holder (for 5 Bars) Best way to store your bars - vertically. Prevent bending. Hold (5) Olympic regular 2"-sleeve bars. Bar Holder (for 9 Bars) Best way to store your bars - vertically. Prevent bending. Hold (9) Olympic / Regular 2"-sleeve bars.